It used to be that when you waited for the Green Line train, a little billboard on the platform told you how many minutes away the next train was. The time is nice, if you have a schedule and the trains are on time (which you don’t and they’re not). The track number? There’s one track going in that direction. This entry was posted in Planes Trains and Automobiles, Public Employees by Mitch Berg. Bookmark the permalink. Pray that I don’t alter the deal further. Just a foreshadowing that $5b more of your money will be spent on tracks 2, 3 and 3 3/4. You see, the problem is not that there are not enough riders, the problem is there are not enough tracks. More tracks, more riders, no? JD, that is another data point for you in your quest to determine how libturds think. Aren’t fascists supposed to make the trains run on time? 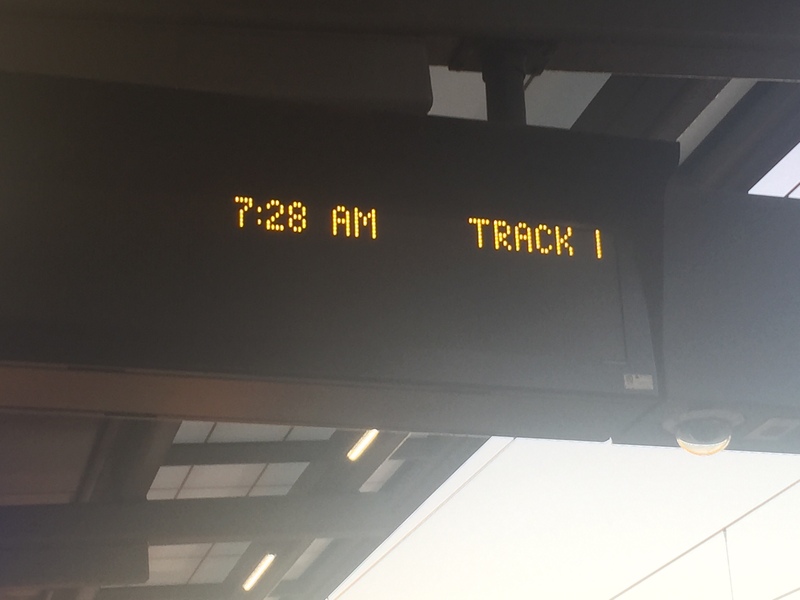 It would be more helpful if instead of a track number, they would point at the appropriate track. It’s all over. You can find anything at most Rochester bus stops except a schedule, and in one case, I walked for about half an hour and was unable to find the bus stop they assured me was there. The bus also, in its circuitous route, was guaranteed to go about 10 miles to cover a five mile route–reducing its mileage from 3-5mpg (of diesel) to 2mpg or less. Yeah, you’re going to need some serious ridership to make that as efficient as a Powerstroke F250 towing a 30′ camper! The Green Line will seem the model of efficiency compared to Honolulu’s light rail, if it ever gets finished. Five to ten thousand dollars per resident of Oahu. The feds picked up a large chunk of that, but they are already trying to get all their money back because of delays, cost overruns, and the general stench of corruption. They maximized the estimate of the number of riders to make it seem as though it was fulfilling a need, and then minimized the number of riders when they had to low-ball the operating & maintenance costs. Oh, and to make up for the cost overruns, the state legislature decided to make the taxpayers on the neighbor islands pitch in for an LRT system they will not get the use of. MP, I am sure once Honolulu line is built and is proven a resounding success through creative accounting, Hawaii to Oahu LRT will get full funding as well. Let’s go with either Train to Nowhere or Train to Oblivion; this side. MP: Aren’t fascists supposed to make the trains run on time? Perhaps those old school fascists did. Today’s fascists would respond by confiscating your watches. Some towns solve this stuff with smart apps. We are so, so, so going to regret blowing all of this money on choo choos. If they depended on people having smart watches the guy who has the job of changing the time would be out of work. In 10,000 years, archaeologists will dig up light rail lines and conclude the society died from excess – and they’ll be spot on. This is actually a very interesting discussion. I’d say it’s Keynesianism —> central planning madness + a declining birth rate. Collectively we have no idea how to be prosperous and develop human capital anymore. So we print money and build Choo Choos with it. That will be mothballed in a few years. I know Honolulu had a very good bus service. Are they going to take that away to force people onto the choo-choo, as was done here? Also, they killed the inter-island fast ferry because it scared the fish, or somesuch eco-nonsense, so instead we have to take planes.